We have just made an upgrade to our online database app creator and our online CRM apps, which have been built over Google App Engine for use with Google Apps. This upgrade adds support for alphabetical indexing of database records and index links for quick filtering from the list views. This has been enabled for the relevant fields in our default CRM application. 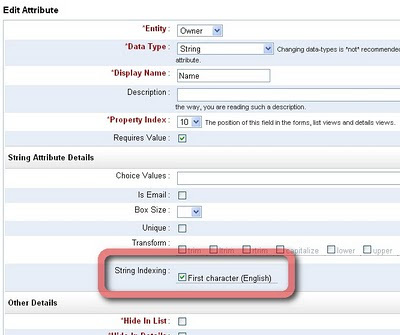 For custom database applications built over iFreeTools Creator, you can enable them for String and Reference attributes, by editing the Attribute and selecting the indexing option, as shown below.. Multiple attributes can be configured to be indexed and they will all be available for filtering from the list views. If there are more than one alphabetical index, you will find a more.. button which you can click to view all filtering indexes. For existing records (added to the database, before enabling the index), you will have to perform a re-indexing operation once, from under the list views More Actions > Re-Index. Hope you find the new feature useful. Keep sending in your suggestions. Our CRM for Google Apps and Online Database App Creator for Google Apps now support attaching of Google Docs to the records within the database. We have upgraded this feature to support attaching any file / folder from within Google Drive. More details are available in this blog post : Attach files or folders from Google Drive to your database records. Below the record details in the details page, there is now an option to attach a file from Google Docs. When you click on the Attach a Google Document button, you will be required to authorize the Google Docs account to use, this can be a Google Docs account associated with either Google user account or with a Google Apps user account. After authorization you can view the list of files in that Google Docs account, with details like the file name, file type and the person who last modified it as shown in the image below..
Just click on the attach button and the file will now be linked to your database record. 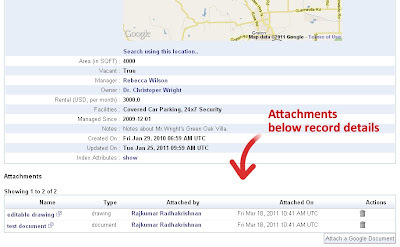 All such attachments will be listed below the record details, as shown below..
Attaching a file in Google Docs does not duplicate the contents, but directly links to the document in your Google Docs, making sure the latest doc can be accessed from the record. The security settings set in the Google Docs are still applicable and you need not have to duplicate those setting again. 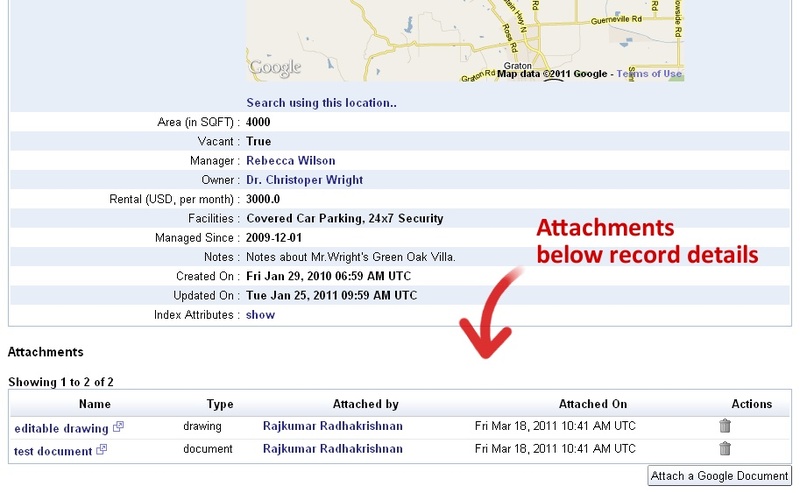 When someone clicks on the attachment link, they are taken to Google Docs directly which handles the security settings. Update :When attaching files from Google Docs to your records, you now have the option to search for the required file based on text, to narrow down the files and attach the required file to your record, as shown in the image below. Hope you find this new feature useful. Keep sending in your suggestions.